(Newser) – Don't fear the plight of wild horses just yet. An online uproar ensued this week after a federal advisory panel recommended killing 45,000 such horses and burros, but Reuters reports that no such plans are in the works. It quotes a spokesman for the US Bureau of Land Management as saying in an email that the agency will "continue its current policy of caring for unadopted or unsold wild horses and burros" and will "not sell or send any animals to slaughter." Left unclear, however, is whether that decision could change when the agency formally responds to the advisory panel's recommendation months from now. The bureau of land Management are heartless pricks! I'll bet they are mostly democraps. Let's sanitize the wild, so we can make more condos and parking lots. Left out in the article are facts. . America's wild horses located across the Western States are also one of America last remaining natural resources left in the wild. . In my State of AZ, they do cull the herds once a years, I'm certain all Western States do as well.. They pick out the sick and diseased horses who need medical help, (shots) or to end their suffering .Smaller herd are relocated for better feeding and water locations. 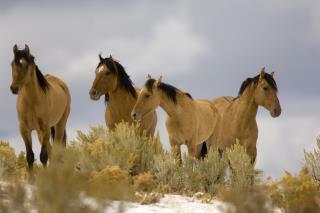 Horses have been found killed by lightening strikes, shot at by (man) and fall victim to coyotes and wolf packs. Left put in this article, is the highly successful prison/ horse training programs in AZ that specially utilize a % of the horses trained by prisoners and are later utilized on our border by our Border Agents. These highly intelligent animals can tack in areas of hostile terrain, where we have no border fences , air cover, drone cover, hostile area that can not be located with ATV's... The illegals in the thousand keep coming into your country, are lead into these areas to cross, the drug keep flowing over the border and no one as you know by now as leadership in DC cares.When these groups are located and detained additional help is sent. Our American Westerns history roots go deep, pointing out that the "horse" left over by the Spanish conquers help to change the West , and changed American history. Thousand more horses are put up for sale each year for ranchers and family to purchase and adopted by other programs. . If you are one of lucky few to see a wild herd of horses grazing on our protected Federal lands it is with reverence, you can still see them at all. Send them to the PETA head office with a note, "Please Ethically Treat these Animals."